Francis Goya (Francis Weyer) born of musician parents in the city of Liege (Belgium). He receives his first guitar at the age of 13 and takes guitar lessons over a one year period to become a true auto dictate. At the age of 16, he forms his first rock band with his brother and a few friends, "The Jivaros". In 1970, Francis is taken on by a professional soul band, "The J.J.Band", With whom he tours Europe and Africa. Their second album is produced by Brian Bennet (The Shadows) for CBS International in London. Thanks to all this he becomes a studio guitarist, accompanying various artists on the international scene, Demis Roussos, Three Degrees, Barry White, Vicky Leandros. In 1975, a solo artists is born, Francis Weyer becomes Francis Goya. Everything speeds up with the recording of his first single "Nostalgia". "Nostalgia" goes straight to the top of the charts, number one in Belgium, Holland, Germany, Norway and Brazil. Followed, one after the other, by gold and platinum disc in Europe, Asia and South America, "Nostalgia" overcome all language barriers and shall speed him over all the continents of the world and become his guide for the rest of his career. In 1981, Francis Goya becomes the first artist in history to record in Moscow with the prestigious Bolchoi orchestra. An event never to be forgotten: accompanied by Balalaikas and 50 Russian male singers. He works lot in different countries with different musicians. This is the period that allows him to experiment with various styles of orchestration and above all to perfect the "Goya Style" - a particular sound with a mixture of sensibility and sunny resonance, appreciated and followed by a faithful audience. Francis Goya is a musician at ease with all styles of music. This is how, contacted by Peter Gistelinck, the producer of the musical film writer Dirk Brossé, he interprets the musical theme for the film "Boerenpsalm" (1989 and the commercial theme from "Koko Flanel" (1990). In 1990, he forms a duo with Carmina Cabrera, the ravishing Bolivian singer, with whom he will record 3 CD's of Latino American style, Bahia Lady (1990) Noche Latino (1993) Festival Latino (1994). With the CD "Bahia Lady" he wins the prestigious Dutch Palm, Prix Edison 1991. In 1991 and 1993 RTL television hire him to orchestrate the Luxembourg candidate for the Eurovision Song Contest in Rome and Dublin. Throughout his career, Francis Goya has recorded at least one album between tours, to arrive at the grand total of 50, for which most will become Gold or Platinum. Total amount of sold albums are 20 million! For new Millennium, Francis Goya and Richard Clayderman, recorded a new Album: "Together". This will receive world-wide distribution. 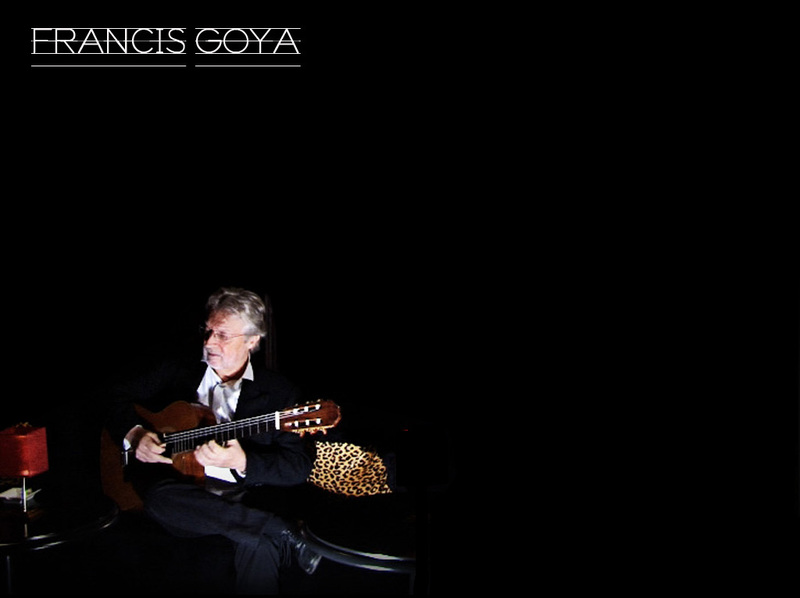 Francis Goya has made 2 world-wide tours. That is followed by a number of invitations in Thailand (1989 & 1992), Finland (1991 & 1992), Canary Islands and the Netherlands in 1994. Since 1995 until 2006, Francis has played lot of concerts in Russia, Poland, Estonia, Latvia, Lietuva, Finland, Belgium, Spain, France, Great Britain, Japan, Austaralia. In October 2005 Francis has made a big charity gala at the Palais Des Beaux Arts de Brussels and collect money for homeless children in Cambodia. All the concerts in Belgium during 2006 has made also for charity and all the incomes went to help homeless Cambodian children.